Yuli Ilyschanka took part in an initial stage of the project — it was he who made the sawn cut of pine tree. 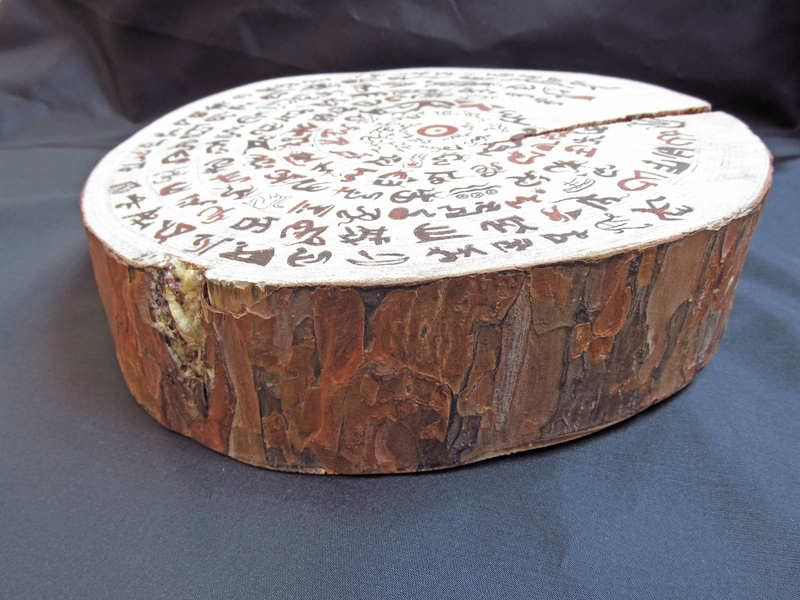 Asemic Letters on the Sawn Cut of Pine-tree is an attempt to recreate a pre-Babylonian language, an attempt to combine features of some ancient (Sumerian, Phoenician, Aramaic, Khazar, Vedic, Ancient Chinese, Egyptian, etc.) languages in pictograms of nonexistent script. Location of asemic signs on rings follows the structure of a tree, but does not copy it: the size of a font doesn't change depending of what distance the sign is away from the centre marked by an Ancient Chinese pictogram of the Sun. 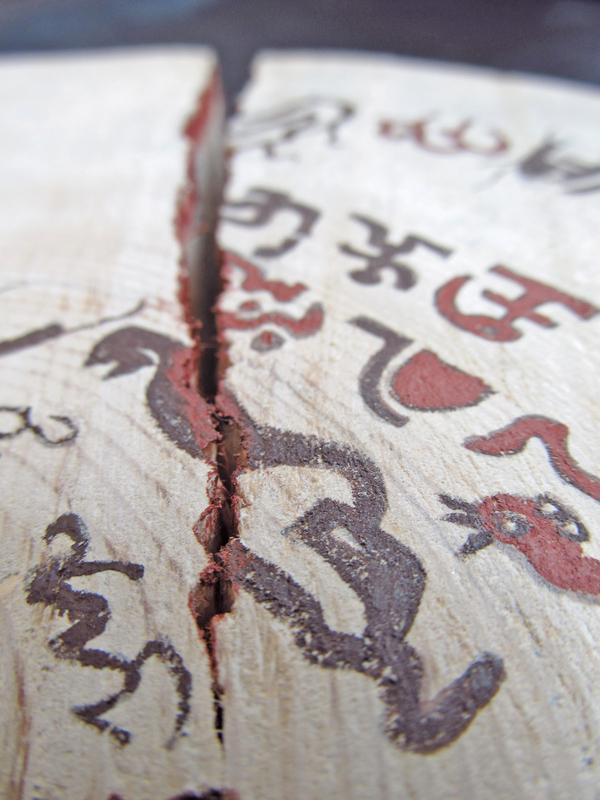 Some of asemic lines are unfinished like some real linguistic branches dried out and fell from the tree of language; some lines are ending their way into a crack and disappearing, just like languages which existed in antiquity, then disappeared and died. The metaphor of 'tree of language' is materialized in this work, but it is transformed visually: a vertical way of presenting an image (from root to branches) is replaced by a concentric one. 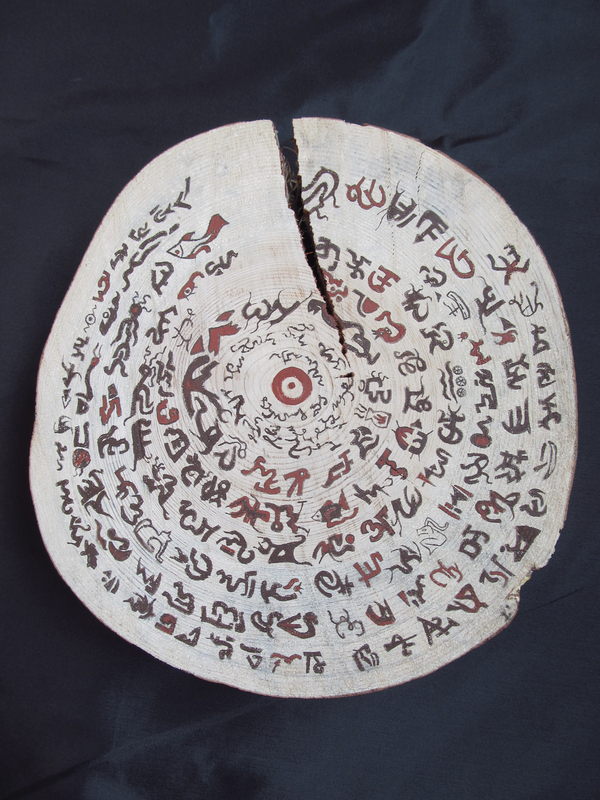 This asemic manuscript grouped around a central symbol by signs of nonexistent essences (because this work is certanly not a scientific attempt of reconstruction) of pre-Babylonian language tells us the story of life of the language as a phenomenon, coming to its origin, development and degradation in a compressed form of circular inscriptions on tree rings. Combining dendrochronology and glottologiya, we restore the language to its natural origin, to its roots — to pre-Babylonian speech. Ekatetina Samigulina. b. 1988, poet, author of asemic writings, member of Lipovy tsvet art group and KYU literart band. She creates asemic writings, shaman poetry, works in 'inner Google' style, visual poetry (http://tae-ateh.livejournal.com/). Publications: Cow's death poem was published in Antipodes (11.11.2011) and Idiot almanac (2012); Asemic translations project was published in Translit journal (May, 2011) and Antipodes (2011); poems were published in Translit journal (2011). She is interested in unintentional writing, on impact through poetry to closed zones of psyche, that is why she is so interested in profound themes: depths of memory, depths of history, abyss of a person's mind. At present she lives in Belarus.